In a medium bowl, whisk together the Greek yogurt, mustard and rice vinegar; season with salt and pepper. Stir in the parsley. Add the chicken, celery, and three-quarters each of the scallions, tomatoes and cucumbers. Stir well to combine. 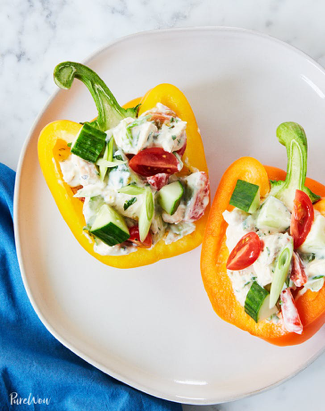 Divide the chicken salad among the bell pepper boats. Garnish with the remaining scallions, tomatoes and cucumbers.